Congratulations to CDN alumnus Paride Antinucci for being awarded the 2017 Tadion Rideal Prize for Molecular Science. Paride’s thesis focused on the function and assembly of Teneurin-3-positive circuits in the zebrafish retina. During his PhD, Paride elucidated the cellular and synaptic mechanisms underling the computation of orientation selectivity in retinal ganglion cells. 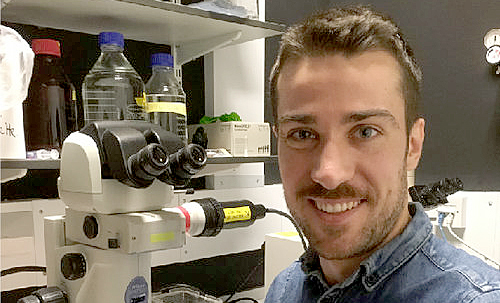 He recently joined Isaac Bianco lab at University College London and Valentina Emiliani lab at Paris Descartes University as a Sir Henry Wellcome Postdoctoral fellow. Robert Hindges, Paride’s PhD Supervisor, offered once again his congratulations: “The Tadion Rideal Prize is awarded annually to only one candidate and I am very proud to see Paride receiving it. This prize appropriately reflects the exceptional work Paride has performed in my lab and he truly deserves it." The Tadion Rideal Prize is valued at up to £1000!